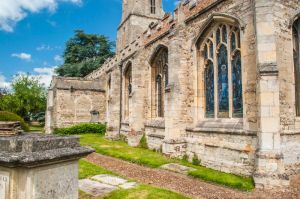 The parish church of St Andrew in Kimbolton dates to the 13th century, though there are records of a church here at the time of the Domesday Book. 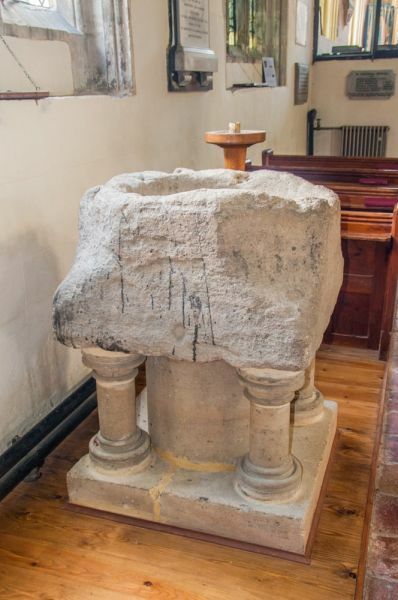 An early Norman building was extended in the 13th century with the addition of north and south aisles, and a tower and spire were added in the following century. 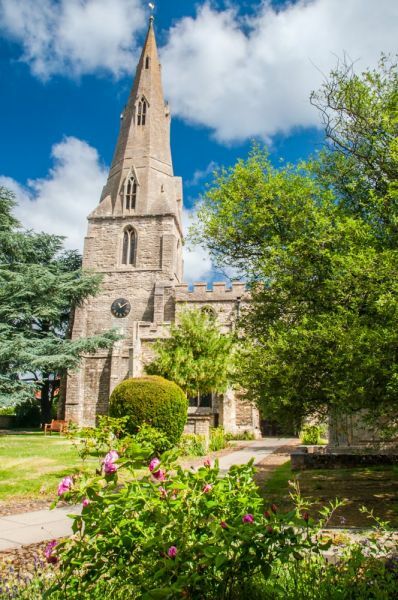 The church was heavily remodelled in the Perpendicular period, and much of the current building dates to that era. 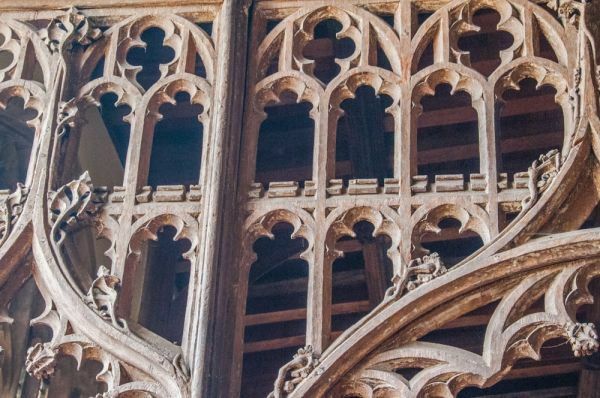 Highlights of the interior include monuments and stained glass windows dedicated to the Montagu family, ancestors of the Dukes of Manchester who held the manor here. The oldest part of the church are the nave arcades, which are 13th century. 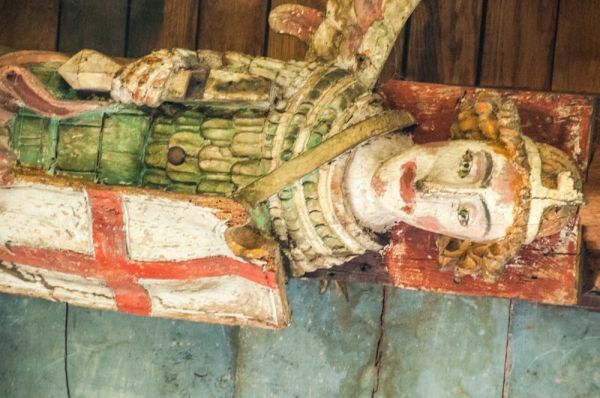 The roof is 15th century, with moulded tie-beams and supports resting on carved 14th-century corbels. 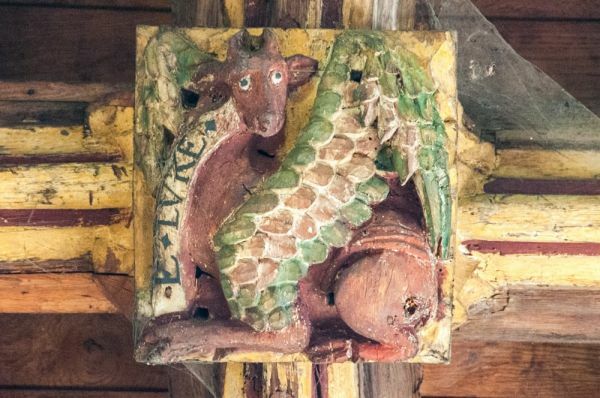 There are finely carved roof bosses decorated with a combination of Biblical figures and an eclectic mix of symbols including flowers, a mermaid, rosettes, plants, trees, and human figures. There is an intriguing square font with scalloped corners, which may be Saxon. 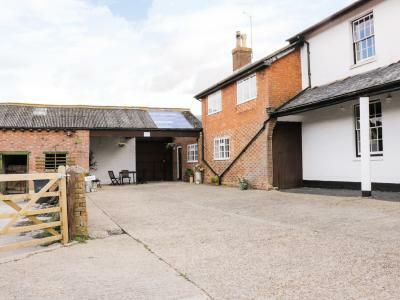 It was for many years used as a cattle trough. 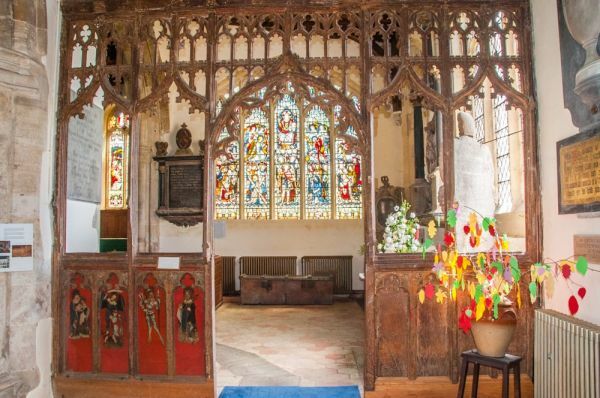 The north chapel is divided from the aisle by a restored 15th-century wooden screen. 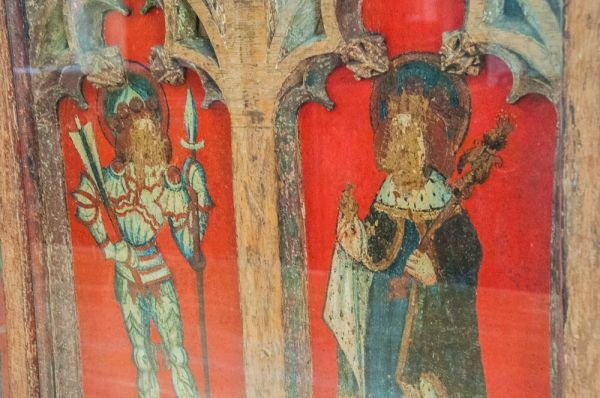 A 15th-century screen also divides the south aisle from the south chapel. This screen has heavily restored paintings on the base panels. 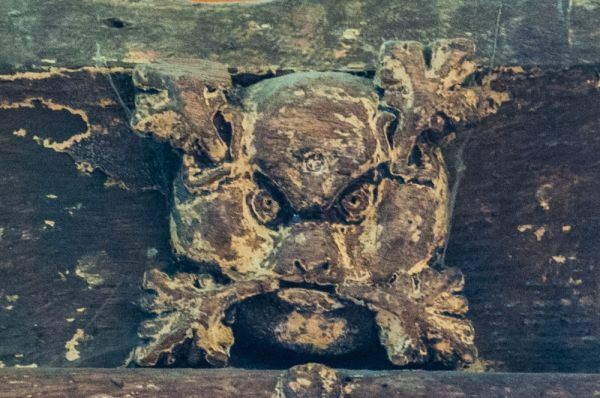 On the upper rail are two carvings, one depicting a devil, or demon, the other showing a traditional Green Man, or wild man of the woods, with vines emerging from his mouth. 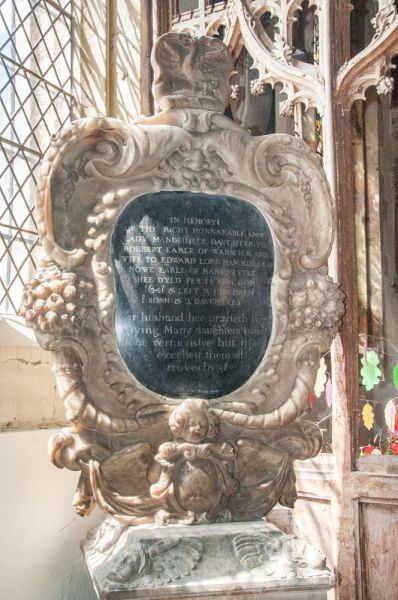 In the south chapel are several memorials to members of the Montagu family. The lovely stained glass window in the south wall is the so-called Tiffany Window, commemorating the twin daughters of the 8th Duke and Consuelo Yznaga. This is the only known example of work by the famous American designer Louis Tiffany to be found in an English church. 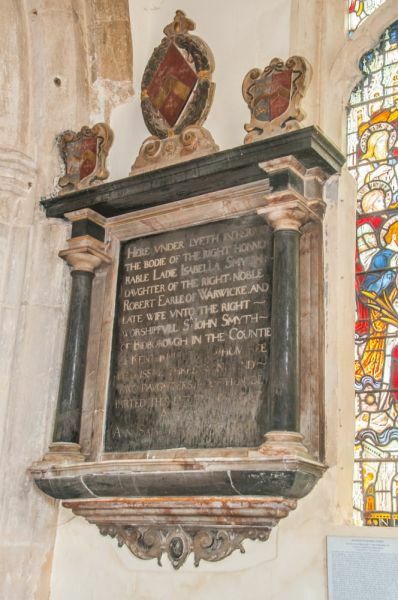 Other Monatagu memorials in the south chapel include that of Henry Montagu, the 1st Earl of Manchester, who was also the first Montagu to live at Kimbolton Castle.